Do you want a portable user-friendly water softener for RV/Marine use? 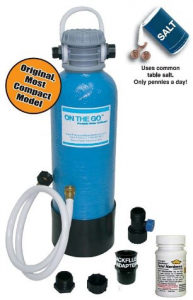 A South Florida portable water softener by On The Go® is just what you need! This compact space-saving softener was built for any RV or Marine owners and features an easy to carry handle, large opening for easy salt addition, quick and easy regeneration. Its compact size makes it easy to install in the smallest spaces. It requires NO tools or electricity and uses a standard hose connection between your RV and the park faucet. The softener provides soft water that prevents hard water & rust stains, avoids scale build up, improves taste and odor, increases the lifespan of appliances and improve rough dry skin while increasing lathering in soaps. ⦁ Simple regeneration with 1 box of simple table salt in less than 15 minutes. ⦁ Compact design 22” h x 6.75” diameter – Weight 18 lbs. ⦁ Compact design 22” h x 9.50” diameter – Weight 32 lbs. The inlet high-flow shut off control valve will allow a slow rinse resulting in improved water quality and greater capacity and is also designed with a 360-degree swivel for easy connection of inlet hose and travel friendly option of cap and plug to prevent leakage. Unit includes hardness test strips, storage inlet/outlet caps, handle inlet hi-flow shut off valve, inlet and outlet hose adapters, back flush adapter, high pressure 4” white drinking hose and full cradle base for a secure setting. The On The Go® portable softener is available through South Florida Water in our service areas of Tampa, Orlando, Sarasota, and surrounding areas to include Land O Lakes FL, Wesley Chapel FL, Zephyrhills, Odessa, Lutz, Tarpon Springs, New Port Richey, Clearwater, St. Petersburg, Spring Hill, Brooksville, The Villages, Ocala, Plant City, Dade City, Wimauma, Ruskin, Riverview, Brandon, Valrico, Lithia, Parrish, Apollo Beach, Lakeland, Bradenton, Kissimmee, Clermont, Sun City Center, Windermere, Sanford, Longwood, St. Cloud, and more. Call today for prices on our space savers! Click here for refill kits.